Did IGN blatantly poach content from Boomstick Gaming? [update] Around 4:30 PM PDT, IGN released a statement regarding this incident. 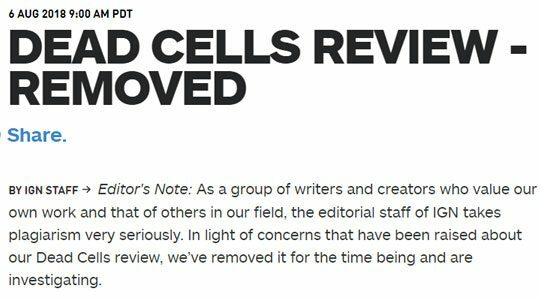 According to this most recent statement (read it below), IGN has parted ways with Filip Miucin and will be re-reviewing Dead Cells. IGN has recently come under fire for allegedly plagiarising content from Boomstick Gaming. The allegations seem to hold a lot of merit and IGN’s response to them seems to have indirectly admitted guilt. On July 24th, Boomstick Gaming published his Dead Cells review – it’s a clear, concise, and objective review, I’d suggest checking it out. Then, on August 4th IGN published their own Dead Cells review which was written by their in-house Nintendo editor, Filip Miucin. As well as being IGN’s Nintendo editor, Miucin also hosts their Nintendo Voice Chat podcast. Unfortunately for IGN, Alex, the founder of Boomstick Gaming, just so happens to be one of their regulars. In a recent interview with Forbes, Alex is quoted as saying he “started to slowly notice my sentence structuring as well as my own thoughts” while reading Filip Miucin’s Dead Cells review – a review that has since been taken down. Upon further investigation, the evidence must have been pretty damning because Boomstick Gaming published a comparison of their review against IGN’s – check it out if you haven’t. After watching that comparison it’s almost impossible to say that that Boomstick’s content wasn’t plagiarised. Funnily enough, Filip seemed pretty proud of this just a day before the review went live. Finishing up my Dead Cells review this weekend. It’s the first IGN video review I’ve edited myself, and I can’t wait to share it with you all. If you still haven’t seen Dead Cells in action, check out the first 21 minutes on Nintendo Switch! Prior to all of this, Boomstick Gaming had been active on Youtube since 2006 and as of yesterday had less than 15,000 subscribers. Today, they’re coming up on 25,000 and growing steadily. At the very least, this bit of drama seems to have worked out in Boomstick’s favor. In closing, plagiarism is bad. However, if these allegations prove true, I don’t feel the blame lies entirely on the shoulders on IGN. Personally, I feel the blame should lie primarily with the writer, Filip Miucin. It would be unrealistic for us to expect IGN to vet every single review to make sure their writer didn’t plagiarise it; especially one that’s worked there for quite some time.